The Fusion 260 Video LED Dive light from Tovatec can be used on any recreational dive or on an all-day expedition. The light produces a maximum of 260 lumens, and a runtime of 2 hours is possible on one 14500 Li-ion battery (included) or 3 hours and 30 minutes on two AA alkaline batteries (available separately). The magnetic slide switch on the body of the flashlight selects three power settings of 30%, 50%, and 100% and an emergency strobe mode. The Fusion 260 is made of an aircraft-grade aluminum alloy and has a rubberized grip. The Fusion 260 Light Adapter (available separately) allows the light to attach to any tray arm. When not in use, the small-sized LED flashlight is small enough to fit in your pocket. The head slides to adjust beam angle from 12 to 100°, which gives a narrow beam for technical diving and a wide-angle beam that's good for photography or video. When the head is removed, it will expand to a 140° beam, which can also be used as an emergency candle strobe or deck light. The pressure safety valve located on the bottom is there to protect the housing and the operator in case of a battery malfunction. Box Dimensions (LxWxH) 6.7 x 4.6 x 1.6"
Fusion 260 Video LED Dive Light is rated 5.0 out of 5 by 2. Rated 5 out of 5 by Acquaman77 from Great light! 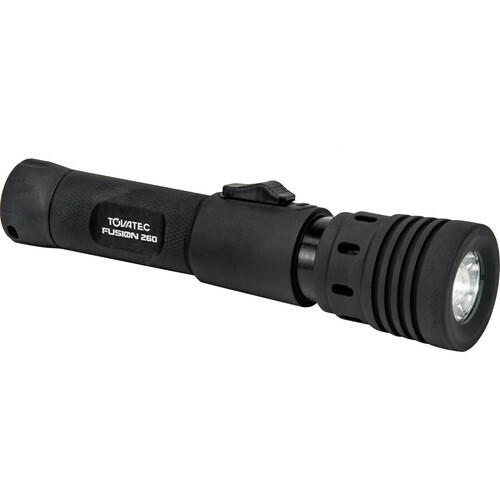 You can use it as a primary dive light or as a video light. I use 2 on Intova arms and a double tray. You can easily dial in the beam angle up to 100 deg. Cross them and their perfect! Great color too. Not too hot. These are also substantial instruments, not plastic toys. Aircraft grade aluminum. You cannot find anything better for the price and no better price than here. Rated 5 out of 5 by greg from Great quality I use this as my back up dive light. The quality is excellent.